The FBI’s October surprise has thrown the 2016 election into November chaos. But an examination of the trigger mechanism behind this event reveals a deeper layer of manipulation by the media and financial interests behind the election. This is the GRTV Backgrounder with your host James Corbett. This report also includes an Interview with Prof. Michel Chossudovsky. 23 Comments on "U.S. Elections “November Chaos”: What You’re Not Being Told"
Here is an interesting view from someone very close to Hillary Clinton. 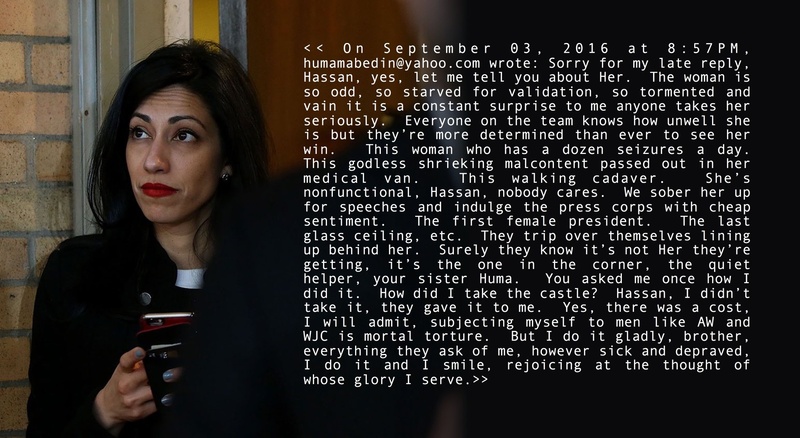 Huma is even closer to the people she serves back in Saudi Arabia. Anthony Wiener knew that people too close to the Clintons ended up dead. So, he backed up the Clinton emails (including the ones she later deleted), on his computer as a life insurance policy. The reality of all this is totally different than what the controlled news media is giving us. I wish you weren’t absolutely correct: BUT YOU ARE! … admitting to being totally morally bereft … which role was she with Kommrade Hitlery, male or female ??? It’s not about morals. She’s a spy, a plant, #2 at the State Department where national secrets weren’t even hidden. The “glory” she serves is not Old Glory. No sir, the military failed us all. I would not put Colonel in front of my name any more because people are going to wake up to this “casino” of a government we have been funding once Mr. Casino Trump gets into office. Name coincidence? Not hardly. The fun hasn’t even started yet, the movie isn’t near over. Unfortunately for your position, the U.S. Military is under ELECTED civilian control … my tour was Korea and the politics were just as corrupt – though NOT as publicized – and NONE of those I served with “agreed to become a killer” for the sake of shedding blood !!! Thus this is NOT the Military’s fault by any stretch of the imagination … with THAT kind of supposition you should blame the garbage collectors because you have trash …. Are you suggesting we should DISARM to show our good-faith and peaceful-intentions to sworn enemies? If so, you ought to research a bit of history starting with Carthage! You’ve got a case against Trump – as if HE was/is responsible for the murderous mess in the Middle East – while obviously ignoring the untold gallons of blood on Kommrade Hitlery & Kompany’s hands … support her in any manner and then and there YOU have become an accessory to/after the fact of her wholesale murders and your hands become just a bloody as hers … DEAD BODIES on Trump’s hands? “0” as in ZERO! You don’t read too well, do you? VA meds scrambled you a little, bud? You totally misunderstood what I wrote. I don’t support Trump or Hillary. Never said anything about disarm. I do, however, support garbage collectors. They clean up messes instead of make them. The rest of what you wrote was wrong also, too much garbled logic to wade through. You get a pass for Korea but I still blame the military for not doing their jobs of protecting America. Period. That is their sole purpose, they failed. If you weren’t personally part of that, good for you. Regardless, serving in our military should never be a badge of honor. That should go to garbage collectors. You should have some of yours taken out. Keep shooting blanks, Colonel. At least you aren’t killing anyone. This “investigation” is nothing more than a kangaroo court. This “investigation” is looking more into the harm done to the hitlery campaign then the treason she has committed! This “investigation” will ruin this country! UK chopped off the kings head….didnt ruin it….read some jefferson. And don’t forget Marie Antoinette . Don’t forget “Reign of Terror”, instigated by external agencies. There’s a vaccine for that.